The Nations Trust Bank Investor Forum Webinar is held to provide the investment community with a holistic, comprehensive understanding of the bank’s financial performance, general operations, future plans and status of the strategic initiatives. 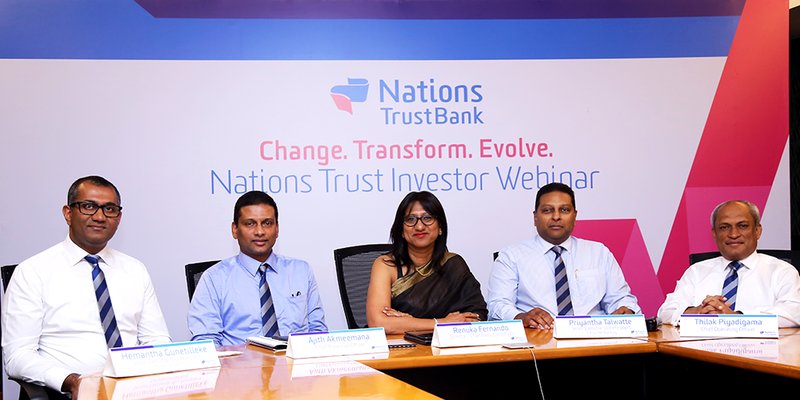 Since the beginning of this year, Nations Trust Bank has conducted Investor Forums via a Webinar providing an easily accessible, flexible platform for investors from diverse backgrounds to participate. Discussing the Investor Forum Webinar, Renuka Fernando Director/ CEO , at Nations Trust Bank said, At the beginning of the year we decided to host our investor forum via webinar for the first time. This was in keeping with our commitment to digital technologies and harnessing the power of the emerging digital, paperless, electronic economy. We were extremely pleased with the results and thus this time too and for the foreseeable future, we will be conducting these forums via webinar. Investors and other interested parties from all over the world are able to tune in without having to take the time to be here in person, which is convenient for everyone. What sets our Investor Forums apart from others is that, while we do focus on financials, we also provide our investors with a well-rounded understanding of our strategic initiatives and accomplishments. Nations Trust Bank PLC is amongst the top 30 business establishments in Sri Lanka, ranked by Business Today Magazine and ably providing a host of financial products and services to a wide range of customers. Nations Trust is also the bank behind Sri Lanka’s first fully digital bank, FriMi. The bank operates 93 branches across the country, boasting an ATM network covering 137 locations along with 23 locations of Cash Deposit Machines plus more than 3,500 ATMs on the Lanka Pay Network and is the issuer and sole acquirer for American Express® Cards in Sri Lanka.